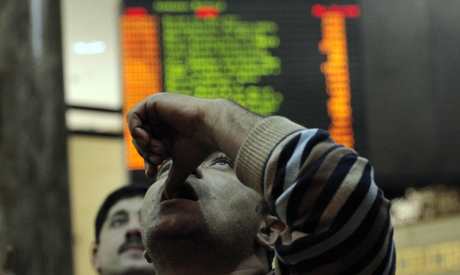 Trading in the Egyptian stock market was suspended just 45 minutes into the day's trading, after recording a sharp decline of 6.76 per cent. Compared to Wednesday, the main stock index EGX 30 pointed to a higher open on Thursday, rebounding from falls of 9.3 per cent in the previous session, to a drop of 6.76 per cent, reaching 4,795 points only five minutes after the bourse's opening. According to temporary trade measures introduced by the Egyptian Financial Supervisory Authority (EFSA) to curb the losses likely to be recorded by the bourse following its two month suspension due to the country's political turmoil, trading on stocks will be carried out within the pre-set price range, with half hour suspensions upon a 5 per cent change in value. "After resuming the session, the volume reached LE626m in the first 15 minutes," said Tarek Abaza, financial analyst at Pioneers Securities. "Yet the bourse is recovering quickly." All sectors except telecommunications (up 5.4 per cent) and chemicals have recorded a decline from yesterday's session due to "yesterday's sharp decline", according to Abaza. "Especially due to the corruption crimes faced by the owners of these company's." Orascom Construction, owned by Egyptian Tycoon Naguib Sawiris, has declined less than the rest of the sector which bowed at a record 33.6 per cent. Yesterday, the bourse's new chairman, Mohamed Abdel-Salam, said the suspending of trade for the heavy-weighted companies of Ezz Group saved the market from a sharper drop. Ahmed Ezz, group CEO, is currently facing charges of corruption and violating anti-competition law. Foreigners unlike yesterday were heavily present, recording around half the transactions (around LE450m). They are net sellers with a slight difference (LE53m). "Foreigners are more active than Arabs and Egyptians," Abaza commented. "Their transactions' volume has reached a total of LE1.25bn." Yesterday, Abdel-Salam told Ahram Online that foreign investors had practically no impact on Wednesday's market. Sigma Securities figures showed they were involved with 7.7 per cent of transactions.